This part of the world homed great civilizations and gave birth to great thinkers, leaders, innovators, explorers, scholars and researchers. South Asia’s identity was rich in the past– be it in term of level of intellectual advancement or the level of prosperity. Past 200 years remained the time of exception, when most of the world went ahead of us and we fell behind. I wish to extend my sincere thanks to the India Foundation for inviting me to speak before this distinguished gathering of intellectuals and luminaries. I commend the India Foundation for playing an important role in cultivation of ideas and creating intellectual infrastructures on important public policy issues. 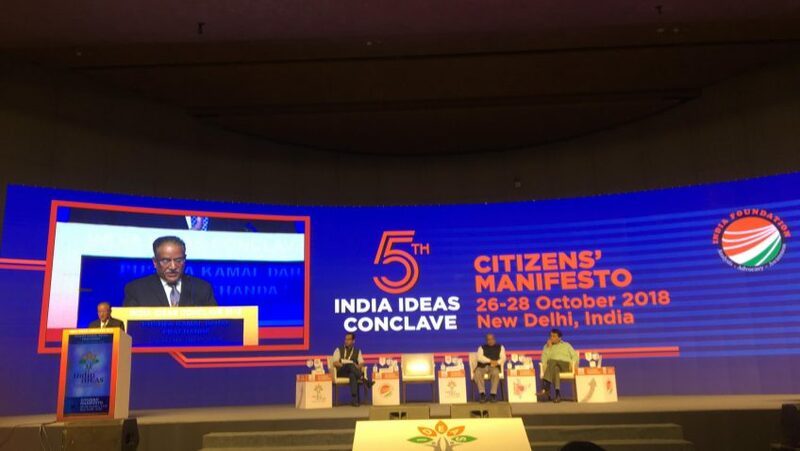 In its fifth year this time, India Ideas Conclave has not only become a flagship event of a different nature but also a unique platform for generating, stimulating and sharing ideas. That ultimately contributes to create a conducive atmosphere for more harmonious and prosperous society. Ideas about what we are as human beings and as citizens of our respective countries. Ideas about what we want to be as societies and where we want to reach as states and global community. 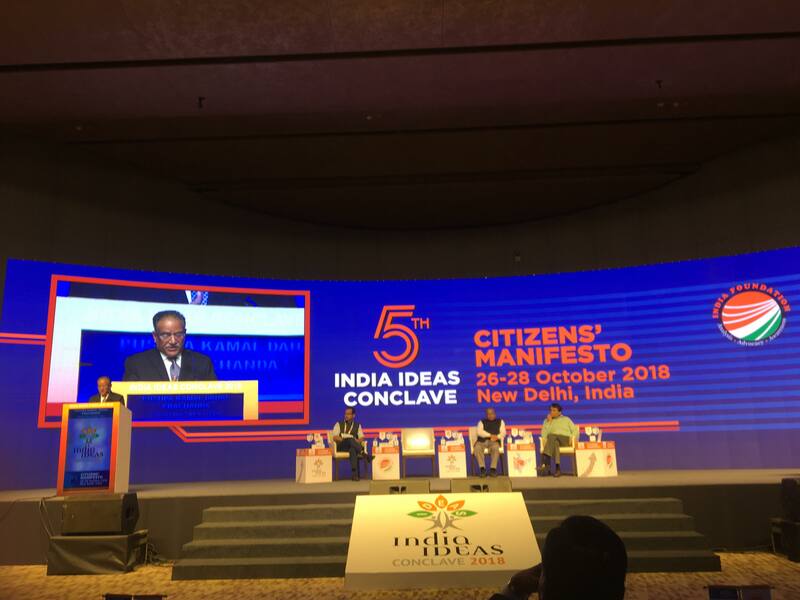 As a premier forum for producing and exchanging views and voices, the Ideas Conclave has been in itself ‘citizens’ manifesto’, if I may borrow the theme words. Ideas do not incubate in vacuum. They are the response of human minds to specific material contexts and circumstances; they are the result of human imagination and creativity. While some ideas are triggered by the urgent need to tackle the contemporary challenges and problems, many are the results of human ingenuity to propel the progress and expand the avenues of evolution. At the advent of every new epoch, some groundbreaking ideas have played the transformative role. While the genesis of ideas starts in an individual as a comprehensive concentration of contemporary consciousness, it takes the whole societies, nations and civilizations to cultivate and nourish them. Sometimes, the ideas of different individuals do not end in convergence. Plurality of ideas add richness to the social discourse. It is the social space for conversation that contributes in harmonization of the ideas. As result of the interactions and exchange, ideas crystalize; they attain broader ownership, deeper meaning and purpose to a newer height. You would agree with me that ideas essentially define us. Ideas are our identity and the guiding light in our journey as humankind.Ideas are not simply abstract construct. They are the foundation on which individuals are shaped up; societies are built and nation states are buttressed.It is the idea of the ultimate destination that motivates us to advance on the path laid down by our collective vision. Ideas help us distinguishbetween right and wrong; moral and depraved; good and evil. It is the mating of human minds and cross-fertilization of ideas, that has brought unprecedented scale of human progress and transformations. Despite the notable human progress over the course of time, the world today confronts a multitude of challenges. We are yet to eradicate the scourge of poverty. Inequalities both within and among the nations are huge. Many countries and societies are lagging behind in the development process. Peace remains elusive in many regions, The sustainability of planet is jeopardized by climate change induced by human recklessness. New vistas have opened up with the transformative fourth industrial revolution, full of new opportunities as well as challenges. Technological breakthroughs in number of fields including Artificial Intelligence, robotics, 3D printing, nanotechnology testify the human ability to conceive and cultivate ideas. However, the expansion of technology’s frontier alone will not suffice. Many countries are yet to benefit from the earlier waves of industrialization. More work is needed on the horizontal expansion and diffusion of technology. The litmus test for any ideas is the level of positive impact they can generate in human life. And inclusivity should be at the core of such impact. When it comes to the history of generation and dissemination of ideas, the region of South Asia undoubtedly commands a unique place in the world map. India has conceived many geniuses whose noble ideas and wisdom has inspired the human civilization. And those wisdoms have not only been a guiding light to humanity, they have also stood the test of time. At a time when majority of the world was confined to the shadows of bigotry and superstition, our region was already enlightened with Vedas and Buddhism. Ancient South Asia provided to the world the countless civilizational attributes– from literature and architecture to physics, metaphysics and medicines; from idea of statecraft to art of trade and industry.From this treasure trove of South Asian civilization, our values system has been drawn even today. The values that were born out of our collective civilizational conviction on harmony, discipline and primacy of the larger public good and interest over petty individual self-centeredness. The values that emphasize more on sharing, caring and co-existence. The ideas behind the principle of peace, inter-faith tolerance, and peaceful existence are answers to many maladies of modern times. Today, a forum like this is absolutely in keeping with the same rich tradition of idea creation and idea generation that our region mastered in long back. In advancing the waves of innovations and inventions in the 21st century, India has much to offer. As I stand before this august assembly of idea generators and opinion makers, I deem it pertinent to share the collective ideas of 28 million Nepalis and their dreams, visions and aspirations for a better future. Subdued for decades under autocratic rules and striving throughpoverty and underdevelopment, Nepali people fought hard and fought long for freedom. Freedom from autocracy; freedom from destitution! As the leader of a decade long armed struggle and then the peace process, I have seen most closelywhat my fellow citizens aspired for. While in armed struggle, my focus was on awakening the most suppressed and marginalized section of the people; instilling in them dream of better future; and enlightening and empowering them. It was a great time of social awakening rooted in the most remote part of the country. In matter of a few years, forts of feudalism started to be shaken up and voices for freedom and democracy reverberated loudly and resolutely. While armed struggle was about awakeningand empowering people, the historic peace process was a course to institutionalize the agendas that people aspired for; process to found the kind of polity that would serve people best; a process to translate people’s enlightened idea of desired socio-political arrangements into the constitution fully owned by people. I have seen every ups and down twist and turn of this historic peace process and democratic transformation. Today, we have the constitution that we can safely call our citizens’ manifesto. Citizens manifesto both in term of the process and content. Process because for the first time in Nepal’s history, the constitution was written and promulgated by an inclusive assembly of representatives directly elected by people. Content because it institutionalizes people’s dreams demonstrated in their decades long struggle. A manifesto that vests sovereignty and state authority in citizens. A manifesto that has committed for continuous improvement through necessary amendments according to the aspirations of the people. A manifesto that seek to promote a strong sense of civic values and preserve the national identity of Nepali people. We have managed post constitution transition as well upon the successful conduct of elections at all three levels of governance last year. Following the elections, governments have been formed at the Centre as well as Provinces with robust popular mandate. After decades of political instability and painful transition, we are finally able to cherish a prospect of stable government, which is essential for development. Having thus accomplished a political process, our focus is nowon the other aspect of people’s freedom, namely freedom from poverty and underdevelopment; freedom from hardships of deprived living; freedom from worry about the basic needs; freedom to pursue the greater goals of life. And to this end, our government is working to realize the vision of ‘prosperous Nepal, happy Nepalis’. We have prioritized certain sectors in our development narrative as well as policy and programmes. We are fully aware that political gains can only be sustained if we are able to create within a short span of time a robust and healthy economic foundation. We are cognizant of our resource limitations and hence, are mindful about the need for the most judicious allocation of the scarce resources. We are thankful for the support received from our neighbours and friends around the world in our development endeavor. We are hopeful that such support will continue. I have no doubt, you may all agree with me that peaceful and prosperous Nepal can only contribute to peace, stability and prosperity in the region and beyond. Before I conclude, I must say that our two countries, Nepal and India, have an immemorial history of harmonious co-existence. We are connected by geography as well history, religions as well as rives, cultures as well as commerce.We are not only neighbours but also close friends. People-to-people interactions and exchanges are at the crux which gives us the very unique nature of our relations. The foundation of our relations rests on cordiality, goodwill, cooperation and mutual respect for sovereign equality. Both of our countries are committed to taking our relations to new height, consistent with the trends of our time and the aspirations of our peoples. Think-tanks like this India foundation could explore more avenues to further expand and consolidate Nepal-India relations in the mutual interest of both countries and their peoples. I wish the Conclave all success. I stop here. And I thank you for your kind attention.